we are offering DG Synchronization Panel. dg synchronizing panel is one of our product which can be used to get total power by synchronise between 2 dgs or between mains and dg. 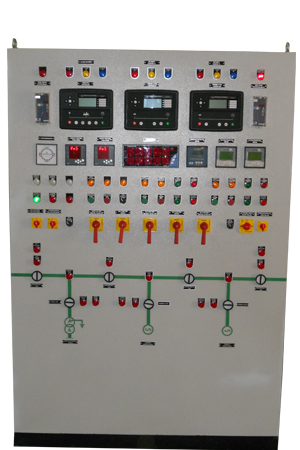 we offer synchronising panel with necessary switchgears like acb mccb, synchronising relay, indicating meters, alarm annunciators, protection relays like ef,rp,ol,uv etc. by installing this panel one can get power from mains and dg or dgs at the same time depends on his load demand. it will automatically start stop dg as per load demand. as special features we can provide synchronising panel with amf and plc so that it can be monitor from control room.